NutriBase supports the generation of publication quality Canadian Nutrition Facts Tables. (We also support the creation of U. S. Nutrition Facts Labels.) To generate a Nutrition Facts Label, create a Recipe (or open an existing Recipe), then click the NFT (Canadian) button." That's all there is to it. You can select additional nutrients to include in your label. In addition to the basic label data, you can add: Polyunsaturated Fat, Monounsaturated Fat, Potassium, Vitamin A, Vitamin C, Calcium, Iron, Vitamin D, Vitamin E, Vitamin K, Thiamin, Riboflavin, Niacin, Vitamin B6, Folate, Vitamin B12, Biotin, Pantothenic Acid, Phosphorus, Iodine, Magnesium, Zinc, Selenium, Copper, Manganese, Chromium, Chloride, and/or Molybdenum. Enter an allergen statement. To do so, check the box for this and type in your statement. Include a sorted ingredient listing. To do this, check the box to include your ingredient listing. Your ingredients will be listed in descending order based on their gram weight contribution to your Recipe. You can edit your ingredient listing as desired. (The ingredient names are truncated after the first comma included in the Food Name so edit as required.) To make permanent changes to the ingredient names, open the Recipe and edit the ingredient names in the Recipe itself. Click the Upper Case and Mixed Case buttons to edit the ingredient cases. You have the option to produce labels in English, French, English/French or French/English. Create the NFT. Create the Nutrition Facts Table by clicking the Create NFT button. 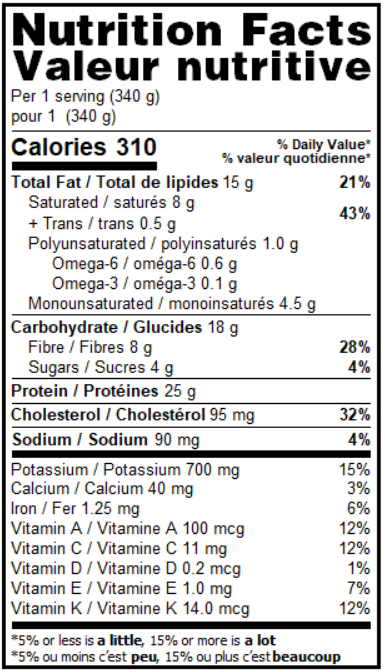 All values will be rounded in accordance with the Canadian rounding rules for Nutrition Facts Labels. The nutrients that are required to be presented as a percentage of daily values will be calculated for you as well. After you create the label, you can print it by clicking the Print icon. To save the label to a publication quality image format, click the Save icon (it looks like a diskette). Notice you can save the label as a BMP, JPG, WMF or EMF. The BMP format is suitable for word processor documents, the JPG file will work on any web site page, and the Windows Metafile and Enhanced Metafile formats are publication quality formats that you can hand over to your print shop for mass production. The label created by NutriBase is basic, yet it is the most popular label format in use today. If you'd like to create labels using different formats, you have some practical options available to you.